We got several inches of snow yesterday. Lyd finished school this morning, so we are now officially on Spring Break. And Daylight Saving Time begins Sunday. One of these does not belong. I was happy to see the fluffy, white stuff because if it’s going to be cold at least it’s pretty to look at. We played outside for a little while yesterday morning and then got on to the important business of making hot chocolate and pancakes and watching Frozen. (When in Rome, right?!) 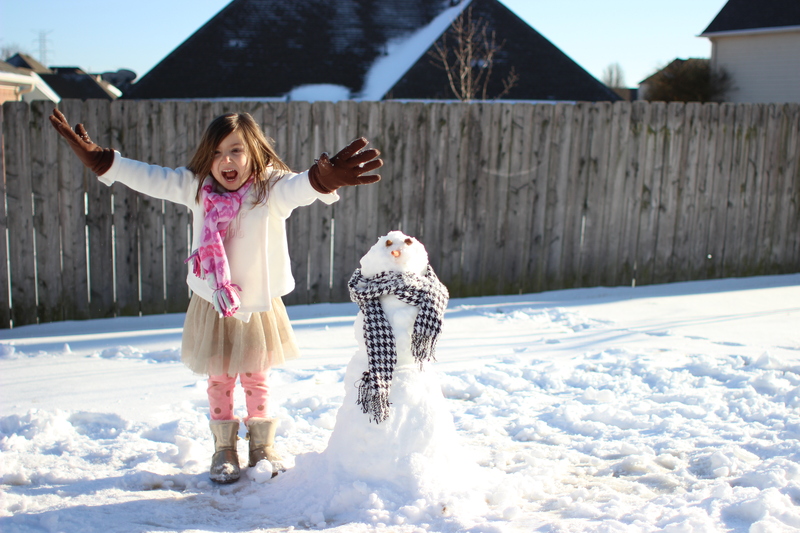 Later in the afternoon, Lydia and I had an epic snowball fight and built a snowman. (His name was Olaf, of course.) And then tomorrow night we get the semiannual curveball that is the time change. Just about the time my girls get situated, it’s time to change it back again. Bring on the caffeine and eye cream. Farm Girl Paints: This Etsy shop is only open a few times a year, but when she was open last month I ordered my Mother’s Day gift. (Side note–I used to think my husband should be able to *know* exactly what I wanted for holidays and birthdays. Turns out, husbands cannot read minds. Good to know. Now, when I have something specific I would like, I tell him. It works so much better.) The bracelets are all made from upcycled leather belts. You can customize the wording to anything you want. I chose the words “break + pour” from this IG post I wrote a little while back. Passion Planner: I saw one of my Texas girls post about this, and I was intrigued. I had to wait about a month for mine to come in, but after having it a week I love it. It gets your thoughts super organized but adds in a lot of motivation and goal planning. Imagine if Martha Stewart and Richard Simmons had a baby. (Wow, there’s a visual.) I’m in a season where it’s very easy to get lost in the day to day details, so this helps me get my head above the pile of playdough crumbles and smushed Goldfish I just swept up. She Reads Truth: I love this little app. I found it during December, and it was perfect for reading the Bible when I was feeding Peach during the early mornings. The app has different reading plans you can buy, or you can get the same plans for free on their website. They also have a One Year Bible plan that is free on the app. That’s what I have been doing this year, and I like it because it combines Old Testament reading and New Testament reading every day. Homemade Playdough: We are at a point where if we don’t get to go back outside soon we might all lose it. To try and stave off the insanity, we made playdough last week. I used this recipe and added some lavender in hopes of calming sibling fighting. It worked. For about fifteen minutes. But, hey, it’s amazing what moms can get done in fifteen minutes. Fish Tacos: Everyone else has been making chili and soups, but we’ve been making fish tacos. Wishful thinking you might call it. This recipe comes from my beloved Heather who sent me a picture of her weekly forecast for Ocala, Florida. My response to seeing lots of 80s and a row of little, perky sunshines–You. Are. Cruel. We can’t all enjoy her delicious weather, but we can eat her fish tacos. Pat fish down with fajita seasoning, place on foiled baking sheet in oven at 350 degrees for 15 minutes. (I use my cast iron skillet and it works beautifully!) Saute sliced onion, red pepper and asparagus in EVOO until tender. Mix corn, black beans, diced avocado, cumin and squeeze of lime in a bowl. Cut fish into strips once out of the oven. Warm up tortilla with a sprinkle of cheese until it melts in the microwave, put strips of fish on tortilla, and cover with sauteed mixture of onion, pepper, asparagus and then mixture of beans, corn and avocado. Pretend you can hear the sound of steel drums and waves crashing instead of kids screaming and ice sheets falling and enjoy.